This is an interesting painting for the Art Collector. It is a striking and unusual modern abstract painting, using an array of colours that compliment each other beautifully. We have always had a love for things a bit different and this is no exception. Standing at 152cm tall by 101cm wide, this is a piece that will definitely capture peoples attention initially for the colour palette and then for the image. 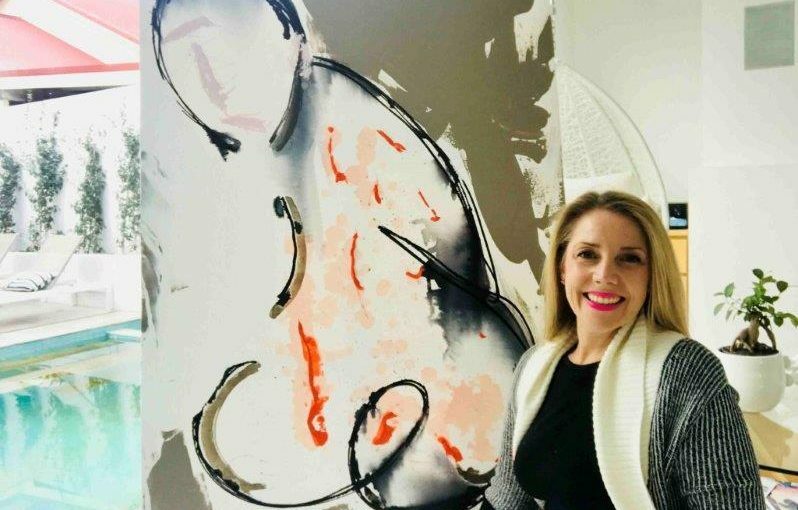 We love creating Sarah Jane Artworks that get people involved, using their own creative minds to interpret the painting, so this contemporary painting ticks the box in delivering that goal. The intention for this contemporary artwork though was to be a lose modern figure of an older man, slightly hunched over to express that he experienced a lot throughout his life. We used soft coloured pink to mark his facial features in an attempt to suggest this was a gentle older man with long facial features to help indicate his age. Burnt orange and peach spots were used throughout the bodyline to mark a sense of spirit still in him. A cooler toned brown was set in the background to bring all the colour tones together in a complimenting fashion. Definitely one of our favourite pieces we hope you all enjoy this piece as much as we do.